Cattleya quadricolorfirst appeared in Europe in 1848 when an English orchid grower named Rucker received a single plant from a friend traveling in Colombia. When the plant flowered in 1849, Rucker sent the flowers to the botanist John Lindley, asking him what it was. The only large-flowered Cattleyaspecies known at the time were Cattleya. labiata and Cattleya mossiae, and Lindley thought the flowers Rucker sent were different enough from these two species to mention the plant in an article he wrote for Paxton’s Flower Garden. Because the new plant had four different colors in its flowers — purple, white, yellow and lavender — Lindley gave Rucker’s plant the simple name Cattleya quadricolor. Lindley was reluctant to claim C. quadricolor as a new species, however, because too little was known about the Cattleyaspecies in 1849. He merely said such a plant existed, and let it go at that. Nothing was heard of the new C. quadricolor for the next 14 years, until Rucker again stepped into the picture and sent a plant to James Bateman, another English botanist. The plant flowered in 1864 in Bateman’s greenhouses at Knypersley, and he described it as a new species on page 269 of The Gardeners’ Chronicle & Agricultural Gazette of March 19, 1864, following up with a picture in Curtis’s Botanical Magazine (Tab. 5504). Bateman called the new species “Cattleya quadricolor,” giving Lindley credit for the name, and, with a full Latin description, a full-sized picture of two flowers, a pseudobulb and a leaf, the story should have ended there. For C. quadricolor, however, this was only the beginning of an interesting trip that would entangle it in a wonderland of botanical confusion. Four years before Bateman described C. quadricolor, the botanist H. G. Reichenbach had described another new Cattleya species from Colombia that he called Cattleya trianaei. This plant also had the same four colors in its flowers that Bateman had described in C. quadricolor. The botanical community looked at Bateman’s C. quadricolor with skepticism, and finally concluded that he had merely re-described C. trianaei. Bateman’s C. quadricolor, instead of expanding the number of Cattleya species, suddenly passed into the mists of forgotten horticultural lore. No one seemed to notice Bateman’s comment that the flowers of C. quadricolor did not open fully — a distinctive characteristic not shared with C. trianaei or any other Cattleya species. Then, in 1873, C. quadricolor received an almost fatal blow. In 1873, Linden and André, in the Belgian publication L’Illustration Horticole (P1. CXX pg. 43), described another new Cattleya species from Colombia that they called Cattleya chocoensis, “The Cattleya of Choco.” This species had the same half-open flowers as C. quadricolor and the same four colors in its flowers. On top of this, Linden’s collector in Colombia had sent him a large number of plants of C. chocoensis, and Linden had to popularize it as strongly as possible or lose money on it. Linden decided to describe the flowers of C. chocoensis as “bell-shaped,” rather than half-open, to make them more appealing, and he wrote glowingly about the lip, which he felt was shorter than normal and enhanced the flower’s bell-shaped appearance. Linden also declared emphatically that C. chocoensis was not a C. trianaei — and who better to say this than the man who had introduced C. trianaei to European horticulture. With Linden’s promotional machinery in high gear, C. chocoensissoon became a well-established Cattleya species, and we find it mentioned in Williams’ The Orchid-Grower’s Manual, and Watson’sOrchids: Their Culture and Management. Linden, of course, published a glamorous picture of it in his elegant book Lindenia. The famous American plant collector John Lager even wrote about collecting it in an article in The Orchid Review of 1894 entitled “Cattleya Chocoensis at Home.” The only negative comment came from the orchid collector Roezl, who could not understand why the plant was named chocoensis when it did not grow in the Choco area of Colombia. Through all this, of course, C. quadricolor became a forgotten name. It wasn’t until 1898 that someone finally dusted off the image of C. quadricolor and called it to the attention of the orchid world. In 1898, an American from Stockton, California, Dr. A.M. Hoisholt, wrote a letter to the British publication The Orchid Review complaining that C. quadricolor had been omitted from The Orchid Review’s listing of Cattleya species. He also sent live flowers and pictures of C. quadricolor to reinforce his complaint. Robert Allen Rolfe, editor of The Orchid Review, investigated the matter, and, in the process, discovered that C. quadricolor and C. chocoensis were the same species and, of course, C. quadricolor enjoyed the botanical priority and was the correct name. Rolfe also concluded that although C. quadricolor “is not equal to C. trianaei in point of beauty, its distinctiveness seems now to be fully established ….” Despite these clear statements on behalf of C. quadricolor from one of Britain’s foremost orchid authorities at the time, in one of the most widely circulated orchid magazines of the day, The International Registration Authority administered by the Royal Horticultural Society only registered C. quadricolor hybrids under the name C. chocoensis for all of the 20th century. When we became aware of this in mid 2001, we made a formal request to the Orchid Registrar to correct the name, and in December 2001 the Orchid Registration Advisory Committee agreed to do this. Cattleya quadricolor is now the official parent for these hybrids instead of C. chocoensis. The similarity between C. trianaei and C. quadricolor has always been a problem for botanists. They have the same color patterns in their flowers. They both bloom at the same time of the year and their growths mature at the same time. They both rest for several months before flowering, both have the widest-petaled flowers of any of the large-flowered Cattleya species and the flowers are exceptionally long lasting. Because of these similarities, it is easy to say C. quadricolor is merely a variety of C. trianaei. 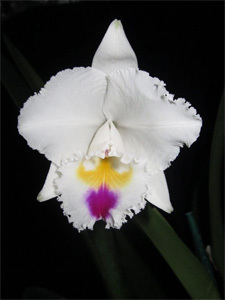 Cattleya quadricolor, however, grows in a different area of Colombia than C. trianaei, and all C. quadricolor have the same distinctive bell-shaped or half-open flowers, which is not characteristic of C. trianaei. Cattleya quadricolor has a fairly strong, pleasant fragrance, while C. trianaei has a more subtle, muted scent. Cattleya quadricolor also grows under somewhat different conditions than C. trianaei. In his 1894 article in The Orchid Review(vol. 2, pg. 307), the American plant hunter, John Lager, described the species as growing “on level land and to a great extent marshy and at time inundated, consequently the moisture the plants receive throughout the year is considerable.” He goes on to say that the conditions drench the plants in a heavy mist all year and that C. quadricolor requires more moisture than C. trianaei to grow well. C. quadricolor is clearly a different plant from C. trianaei in many respects although it took decades for this to be fully recognized. As a Cattleya species, C. quadricolor has all the usual color forms of the large-flowered group. The plant originally described by James Bateman in 1864 was a lovely semialba. There are also true albas, albescens and many lavender forms. Pale lavender flowers predominate and there are very few really dark lavender clones.Cattleya quadricolor is noted for its wide-petaled flowers, and, in many clones, the petals actually touch or overlap. Cattleya trianaei, of course, is famous for having wide-petaled flowers, but wide-petaled C. trianaei are relatively few in number compared with C. quadricolor. The big problem withC. quadricolor is that its flowers are always opening, but never really open. Although they have the wonderful four colors that make C. trianaeiflowers so beautiful and popular, C. quadricolor remains a stepchild among theCattleya species. When we look at it in the broadest sense, however, C. quadricolor may be the wisest of all the large-flowered Cattleyaspecies. Its bell-shaped, half-open flowers are an important survival mechanism. They appeal to insect pollinators such as bees, but not to orchid predators like man. When you consider that C. quadricolorgrows in a very limited area of Colombia and the large-floweredCattleya species were plundered mercilessly for almost a century, the fact that C. quadrcolor is still available in these areas is testament to the effectiveness of its survival mechanism. Hybridizers have done relatively little with C. quadricolor compared with the other large-flowered Cattleya species. Most efforts have been aimed at trying to keep its wide-petals while still enjoying fully open flowers in the hybrids. The color of its flowers are as beautiful as any you will find in the large-flowered group, so there is hybridizing potential in the species. A cross between C. quadricolorand Blc. 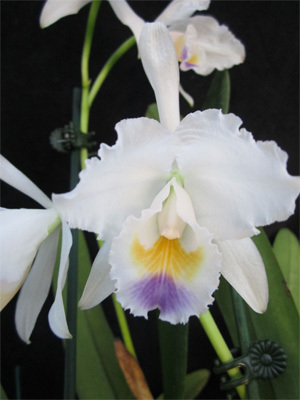 Helen Huntington was even good enough to be registered recently under the name Brassolaeliocattleya Georgien Cataldo. No Cattleya species collection would be complete without C. quadricolor. It usually flowers for us at Christmas, and on a festive Christmas Eve, we often look at it as Mother Nature’s Christmas Bells. Cattleya quadricolor is one of the easiest of the large-floweredCattleya species to grow. It is vigorous and has a greater-than-normal resistance to root rot. It will usually send out a new growth in late February or early March in the United States, and complete the growth by early summer. It normally makes a second growth as soon as the first one is completed, and will rest until late October before forming buds in the sheath. Cattleya quadricolor flowers about mid-December in the United States, just before the earlyCattleya trianaei come into bloom. During its active growth period, it should receive lots of sun, moving air and water. Cattleya quadricolor will tolerate a wet medium better than other large-flowered Cattleya species and can take extra water during its growing season. The medium, however, should never be allowed to become excessively wet or soggy because this can kill the plant’s roots. Cattleya quadricolor should be repotted just after flowering, as soon as new roots appear on the front pseudobulb.